Tshirts are generally heavyweight, quarter-turned,100% preshrunk cotton. Most are Gildan "Ultracotton," very soft and good quality. Sometimes Hanes or other brands may be used. Note: they are cut generously and run large. They're taped shoulder-to-shoulder and fully double-needle stitched. Colors: Vary. But generally white, natural, ash gray, light blue, royal, forest, navy, olive, burgundy, many more! I take requests! Long sleeve shirts are heavyweight, soft, 100% preshrunk cotton. Quarter-turned. Seamless collar. Taped shoulder-to-shoulder. Double-needle stitched neck and hemmed bottom. These are unisex-- sleeves do run rather long. Colors: white, natural, sand, maroon, purple, indigo, royal, grey, black, navy, forest,Texas orange. Baseball shirts are medium weight with 3/4 length sleeves. They are l00% cotton, 6.1 oz fabric. They are a slightly more tailored than the Tshirts, which tend to run oversize. Colors: White body with arms in: navy, black, red, royal, green, gold, Texas orange. Heavyweight sweatshirts are really warm and comfy. These are mostly 100% cotton (some brands are 90/10 or 80/20) and stay soft and cuddly through many washings. Mostly Gildan, Hanes and JerZees heavyweights. Colors: Depend upon size, but LOTS of colors. Please ask. Listing just a few: white, natural, ash, sand, grey, burgundy, indigo, leaf, forest, medium blue, purple, red, yellow. Sleep shirt/Tshirt dress: Ladies SoftTee Dress with Patch Pockets. 100% preshrunk combed ring-spun cotton jersey, 4.2 oz. Fabric is a thin, lightweight, very soft jersey. Scoop neck with bound-on self-trim, two patch pockets at sides, double-needle sleeves and bottom hem. Slightly fitted silhouette, side seamed. 37 inches long, 22 inches across. Fits size S, M, L. Gotta love the pockets for a beach coverup or for a sleepshirt! Colors: White, yellow haze, frost pink (Lights); Caribbean Blue, Violet, Heather Gray, Azalea (bright pink). Colors: White, Navy, Heather Grey, Black, Orange, Pink, Forest, Ash Grey, Red, Royal Blue. Ladies' scoop neck is preshrunk, heavyweight l00% cotton. It has a bound-on self trim neckline and double-needle stitched bottom and sleeve hems. Colors: White, yellow haze, blue frost, frost pink, frost orchid, spruce, black, violet, mountain rose. Ladies' Tank Top is preshrunk, heavyweight l00% cotton, fashion cut for women. It features bound on rib around neckline and armholes. Double-needle stitched bottom hem. Colors: White, yellow haze, frost pink, key lime, heather grey, black, red, violet. Totes-- Three sizes, so no excuse not to "go green" and take your tote to the grocery store! All are sturdy cotton canvas. Standard Tote: 14"high x l0 l/2" x 5" deep. 24" handles. A very convenient size. 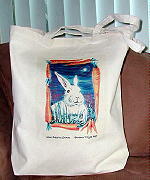 Large zipper tote: 22" x 15"x 5" with 24 inch handles. Top zipper plus a zipper compartment inside. Jumbo Grocery Tote is ideal for packing in lots of stuff. Your celery or baguette can stick out the top! It measures 18" x 19" x 4.5." All these totes are practical and Natural in color. Aprons-- New, by request, are some bunny aprons! These are comfy and handy 2-pocket heavy duty aprons. The colored aprons (forest and navy) are polyester/cotton; the natural one is 100% cotton canvas. They all have a very nice feel to them. They have tie backs and are 28 inches in length. 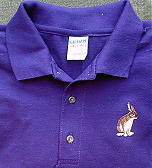 Polo Shirt with embroidered brown rabbit, beige rabbit, squirrel, guinea pig or other emblem by request. 100% cotton or ultrablend (50/50 cotton/poly) heavy or medium weight sportshirt. Pique or jersey fabric. Colors: please inquire. Shown: Dark purple. Want to go straight to the Order Form? Or maybe back to the Main Page? Or back to Designs?